ARLINGTON, VA – JULY 1, 2013 (UPDATED AUGUST 9, 2013) — PBS announced today the details of a special week of programs and online events and activities celebrating the 50th anniversary of the historic 1963 March on Washington, a watershed moment in the Civil Rights Movement that helped usher in sweeping civil rights legislation and a sea change in public opinion. In addition to the premiere of THE MARCH, a new documentary about the dramatic stories behind the event, the PBS Black Culture Connection website will debut The March @50, a provocative five-part web series exploring whether America has delivered on the promises of the March. Memories of the March, a series of video vignettes created by PBS member stations, explores additional compelling local stories of the March, providing a variety of perspectives on this historic event and its ongoing legacy. THE MARCH, narrated by Denzel Washington, premieres on Tuesday, August 27, 2013 at 9:00 p.m. ET (check local listings) on PBS, the eve of the 50th anniversary of the original event. The film reveals the dramatic story behind the event through the remembrances of key players such as Jack O’Dell, Clarence B. Jones, Julian Bond and Andrew Young. Supporters and other testimonials of the March include Harry Belafonte, Diahann Carroll, Roger Mudd, Peter Yarrow and Oprah Winfrey in addition to historians, journalists, authors and ordinary citizens who joined some 250,000 Americans who thronged to the capital on that momentous day to peacefully demand an end to two centuries of discrimination and injustice. THE MARCH is a Smoking Dogs Films Production produced by Lina Gopaul and David Lawson and directed by John Akomfrah. Executive Producers are Krysanne Katsoolis, Cactus Three, and Robert Redford and Laura Michalchyshyn, Sundance Productions. Sam Pollard is Consulting Producer, with Gina Belafonte as Associate Producer. In addtion to the U.S. premiere on PBS, THE MARCH will be screened by international broadcast co-producers the BBC and France 3. 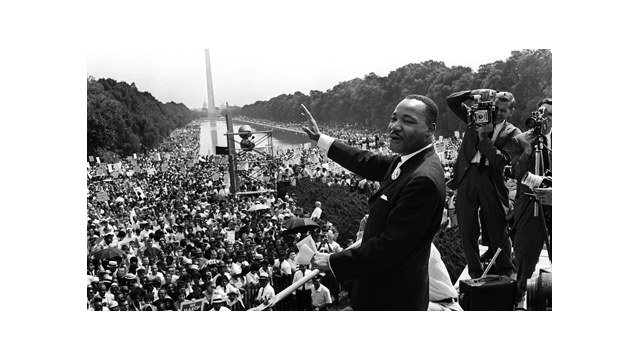 As part of the 50th anniversary March on Washington programming, PBS will present several encore broadcasts. AMERICAN MASTERS “James Baldwin: The Price of the Ticket” is scheduled on Friday, August 23, 9:00-10:30 p.m. ET. And on Tuesday, August 27, bookending the premiere of THE MARCH will be encore broadcasts of IN PERFORMANCE AT THE WHITE HOUSE “A Celebration of Music From the Civil Rights Movement,” 8:00-9:00 p.m. ET and INDEPENDENT LENS “The Powerbroker: Whitney Young’s Fight for Civil Rights,” 10:00-11:00 p.m. ET (check local listings). PBS Black Culture Connection will unveil The March @50, a new web series by filmmaker Shukree Hassan Tilghman (More Than a Month) as part of the PBS celebration of the March on Washington Anniversary. With a new episode debuting each week for five weeks, The March @50 asks if America has delivered on the original demands of the marchers for jobs and freedom. Each episode will explore the March’s legacy through the lens of contemporary issues ranging from minority incarceration, disproportionate minority unemployment, the re-emergence of public school segregation and voting rights. The 1963 March on Washington was created by community activists and dedicated people from every state in the country. Memories of the March, a series of video vignettes created by PBS member stations from across the nation, will also debut on PBS Black Culture Connection. Fascinating first-person stories of original participants who made the trek to the nation’s capital are included, as well as others who were instrumental in working for the cause in their communities. Vignettes include interviews with several women, including Johnnie Turner, a Memphis college student when she attended the March and now a Tennessee State Representative; Dorothy Foreman Cotton, the highest-ranking woman in the Southern Christian Leadership Conference during most of the 1960s; and Georgia Davis Powers, the grandniece of a slave who helped organize the 1964 March on Kentucky’s State Capitol, an event in which Dr. King also participated along with baseball great Jackie Robinson. Other interviewees include Sala Udin, a 20-year-old from Pittsburgh who heard Dr. King’s speech and changed the course of his life to launch a career in civil rights activism and North Carolina Congressman G.K. Butterfield, who attended the March and became known for his successful litigation of voting rights cases. On August 28, 2013 — the actual 50th anniversary — PBS Black Culture Connection will host a full day of special online events and activities including screenings of THE MARCH during which viewers can interact with some of the film’s participants, online chats with original March participants and community leaders, and hosted discussions about the many aspects of the March and the Civil Rights Movement. Major funding for THE MARCH, Memories of the Marchand The March @50 is provided by the Corporation for Public Broadcasting’s Diversity and Innovation Fund which supports content that engages diverse viewers and encourages the use of emerging technologies to reach new audiences and PBS. The Corporation for Public Broadcasting (CPB), a private, nonprofit corporation created by Congress in 1967, is the steward of the federal government's investment in public broadcasting. It helps support the operations of more than 1,300 locally-owned and -operated public television and radio stations nationwide, and is the largest single source of funding for research, technology, and program development for public radio, television and related online services.